There are many fun activities for rainy days in the Hamptons, however most of them are under the radar, and therefore underutilized. Many times we make art projects, or go to crafts classes, perhaps visit the children’s museum, Parrish Art Museum, or the library. However, there are some other interesting options like the Dan Flavin Institute located in the town of Bridgehampton. If you and your children love lights, like we do, than this is a must-see! Dan Flavin’s work is magical, using fluorescent lights in various colors to change spaces and the way you view them. His installations are mesmerizing and the way the space in Bridgehampton uses the reflections of the light is very cool because you become part of the art. Additionally, unlike most things in the Hamptons, this is free! My girls loved it and will definitely be returning again soon. Established in 1983 as a permanent installation of Flavin’s work, this renovated firehouse holds a permanent installation of nine works in fluorescent light created by the artist between 1963 and 1981, and a gallery for changing exhibitions. Planned by the artist for the second-floor gallery of the space, the permanent installation traces Flavin’s practice from 1963 -- when he decided to work solely with standard fluorescent fixtures and tubes -- to 1981, just before the presentation was realized. 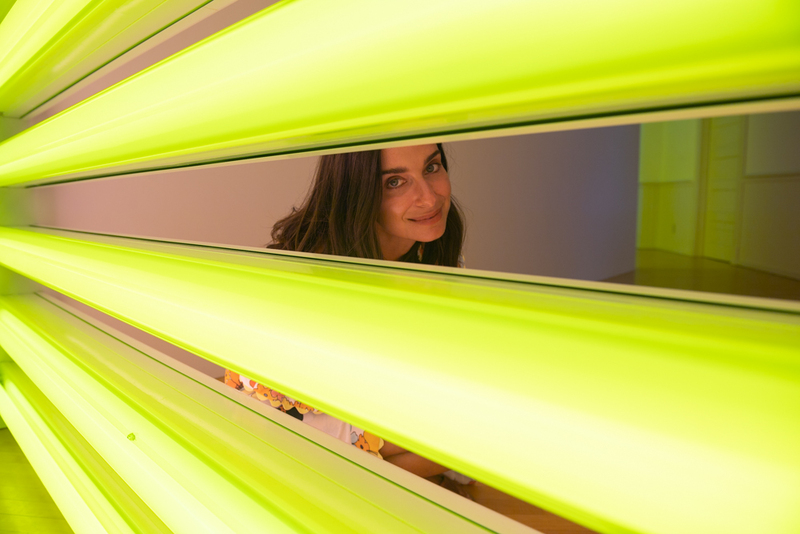 In creating this exhibition, Flavin conceived of the sculptures and the architecture as a single, unified installation. By manipulating the formal, phenomenal, and referential characteristics of light, the installation asks viewers to consider a series of contrasts -- between colors, intensities of light, structure and formlessness, the obvious and the mysterious, and the serious and the humorous. Originally built as a firehouse in 1908, the building operated as a church from 1924 to the mid-1970s, and was renovated under the direction of the artist to evoke the building’s former uses: a newel post in the entrance hall is painted red in memory of the building’s years as a firehouse, and the original church doors have been moved to the entrance of a small exhibition space on the second floor that contains memorabilia, including a neon cross, collected from and about the church.